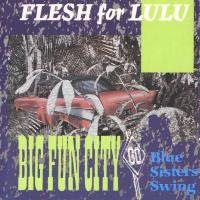 Flesh for Lulu was an Alternative rock/Gothic band formed in Brixton, London, UK, and was active between 1982 and 1992. Their music was a mix of the New York Dolls and Rolling Stones with gothic rock's gloomy atmosphere and aesthetics. Nick Marsh (vocals and guitar) and James Mitchell (drums) formed the band and soon recruited Rocco (originally from Wasted Youth, guitar and vocals), and Glen Bishop (bass), taking their name from an American cult movie. They signed to Polydor Records in 1983, and soon thereafter, bassist Glen Bishop left to join Under Two Flags, and was replaced by Kevin Mills (formerly of Specimen). The label dropped them a year later after their eponymous first album failed to find any commercial success.